Discover the flora and fauna of CBEC’s 510-acre wildlife preserve. 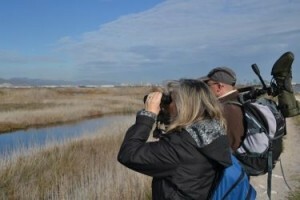 Spend an hour or spend a day exploring native woodlands, tidal marshes, and meadows through these and other specially designed self-guided experiences. Independent explorations have been designed for families, community and school groups, or even individuals who wish to discover CBEC on their own. Explore our many themed walking trails, search for over 200 species of birds regularly seen at CBEC, observe many habitats and numerous types of plants and wildlife. Return again and again to discover the rich, ever-changing world of the Chesapeake Bay’s tidal marshes throughout the seasons. There is no admission fee to explore the property on your own, but donations are appreciated to help us maintain our trails. Don’t forget to dress for the weather and bring along a water bottle or snack. Indoor and outdoor restrooms and picnic facilities are available. Stop in at the Visitor Center for maps, materials, and more information. Click here to download the Self-Guided Experiences brochure. Walk around our ponds, see and hear native wildlife, and take in beautiful views from observation decks and blinds. Explore the 4 miles of hiking trails on your own or even lead your own field trip – all at your own pace. Maps and trail descriptions can be found on our Website, and both inside and outside of the Visitor Center. Trails are marked and QR codes are posted on signs. Use a downloadable QR Code Reader App on your smartphone while you are hiking for more information and photographs that may help you to find your way on our 510-acre preserve. Click this link to visit the Hiking web page. Discover an amazingly diverse array of tiny organisms. Concentrating on microbial life, the tour will discuss representatives of the six kingdoms of living things (Bacteria, Archaea, Fungi, Plants, Protists, and Animals), as well as viruses. The role that these organisms play in their immediate environment, their effect on the larger biosphere, and their ability to teach us about the past and the future are also discussed. To take the tour, visitors may use the Tiny Things Tour Map along with the List of Tiny Tour Stations. The Tour can be viewed from our Website before and during the Tour. Copies are also available in the Visitor Center. Click this link to visit the Tiny Things Tour homepage. Set your own goals and identify objects by your choice of color, letters of the alphabet, shapes, numbers, size, habitat, or even specific flora and fauna. Themed hike clipboards are available in the Visitor Center. Identify as many species as you can; upon completion, return your worksheet to the Visitor Center for a special CBEC Stamp! Learn to recognize trees and their many characteristics – such as bark, leaves, and fruits. Are they Deciduous and Coniferous and what does that mean? Use our self-guided Tree ID Brochure and Take-Along Backpack as you meet the trees of CBEC. A youth Tree ID Brochure is also available. A map will lead you to CBECs trees that are tagged with their names and a QR Code. By downloading a QR Code Reader App on your smartphone, you can scan a tag and instantly learn more about the tree. 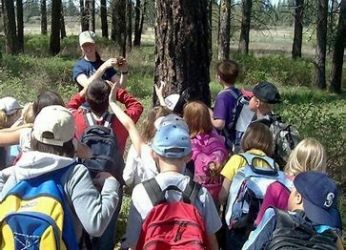 The Take-Along Backpack contains the tree map, Tree ID Brochures, tree activities, and all of the materials you need to explore our most common trees. Once you have “met” some of our trees, take our Mystery Tree Challenge. Can you identify ten of our most common trees? We bet you can! Don’t hit the trail without our educational backpack! The Explorer’s Backpack contains everything needed for you or your group to explore the habitats, inhabitants, and experience the sounds and smells of nature. Available for sign-out in the Visitor Center, it includes a trail map and descriptions of each trail, field identification guides, binoculars, observation supplies, journals, and a take home scavenger hunt worksheet. Take a moment to enjoy the Hummingbird and Butterfly Garden. Hummingbirds, butterflies, bees, and other pollinators abound in the garden featuring mostly native plants and flowers. Have a seat on the observation bench and take notice of the buzzing and fluttering activities and record your observations in the observation log found in the garden mailbox. If you love the outdoors, high-tech equipment and adventure then the hobby of Geocaching is for you! Here at CBEC we have over 10 caches to find, so spend the day with family, friends or co-workers, bring lunch and explore the various habitats of the Chesapeake Bay. A list of the geocaching coordinates can be found on our Website and in the Visitor Center. Click this link to visit the Geocaching web page. What plants and animals call CBEC home? Download the iNaturalist App on your smartphone to record your observations and help us document the biodiversity of CBEC! Join an online community of citizen scientists, photographers, and amateur and professional naturalists, and share your photographs and observations. Click this link to visit the iNaturalist website.